If you picked Texas to beat the Sooners last week, email me. I need your help making picks this year, apparently. @DrKurtis @thepokereport yeah, you've struggled a LOT on your picks lately. Like giving whoever you pick the kiss of death. I’m not saying Texas is bad, because they’re not. The Longhorns are loaded with talent, but most of it is young and it didn’t appear as if Texas were playing cohesively enough to win big games, especially in Big 12 play. 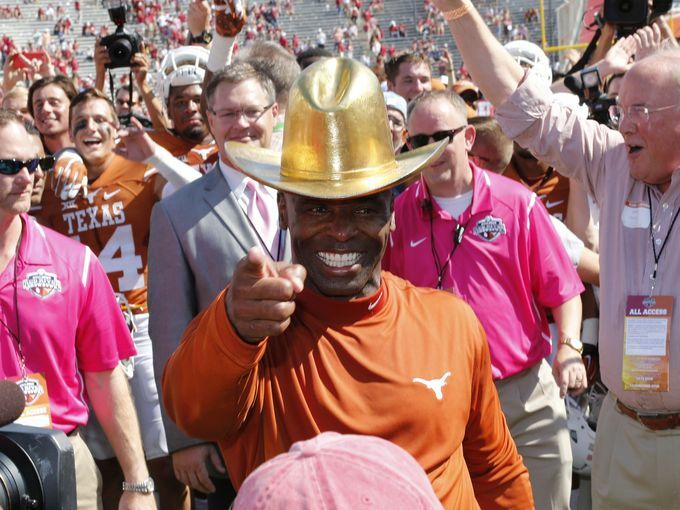 More specifically, it looked as if Texas’ special teams was a train wreck. First, Nick Rose missed a PAT – not even a chip-shot field goal, a PAT – against Cal which cost the ‘Horns the game. Then, a week later against Oklahoma State, punter Michael Dickson dropped a snap. Mind you, it is Dickson’s first year playing American Football after playing Australian Rules Football as a defender in prep school, however it wasn’t anything to do with the style of game. He merely dropped the snap. Then, TCU shellacked Texas in Fort Worth, and now the Longhorns are supposed to play Oklahoma? Seriously? But, they did. Texas showed the nation what many in the nation, myself included, had forgotten. That was that the Longhorns are in fact a good football team surrounded by a series of unfortunate events and circumstances. It’s as if Lemony Snicket wrote this year’s Texas season to start. Although I never doubted Charlie Strong’s abilities as a coach, I did forget that Texas has hands-down the roughest schedule in major college football. Open the season on the road against a pretty decent Notre Dame team? No thanks, I’ll pass. Follow it with Rice as your home opener? Yeah, maybe. End nonconference play with a Cal team that is lightyears ahead of last year’s Cal team? No thanks. Open conference play with arguably the most underrated team in the Big 12? Pass. Follow that with the preseason favorite to win the conference ON THE ROAD? Hard pass. Hit the road again, this time to play your arch-rival on national TV? I’m thinking no. Texas is going to look bad at times this year, but those are just growing pains. If you sport burnt orange week in and week out, just make it through this year. I promise you, it will be worth it in the long haul.